I was around 8 years old when I first attempted to fly. I would run down the pool decking, as fast I could with arms spread very wide. Soaring through the air at a height of 4ft altitude for approximately .5 seconds was such an amazing feeling. I could do it all afternoon in the hope of delaying the crash bang landing on to suburban lawn. Around this time my Dad found an old keyboard under the neighbours’ house. Too honest to steal… he secured it for me with their permission. It was a crappy red vinyl keyboard with one broken key but I loved it like no tomorrow. It was a major advancement from my recorder playing. I would woo the other kids at primary school performing recorder solos of their fave 80’s songs at lunch time. I was lucky to have the gift of playing music by ear. But this was not approved my piano teachers to come in following years. Yep, my folks either got sick of the tinny sound of the keyboard or noticed that my passion for music was unyielding and decided to invest in a beautiful old second hand piano. So I sucked at lessons. I was lazy at reading music, un-inspired by my teachers and used to play the sheet music by ear – after them! Now I’m older I wish I had of paid more attention but I was young, and addicted to composing my own songs and playing everything the easy way. I fell into my first band at 19. A Sydney chick rock band and I played the synth. Then another chick band, this time an instrumental jazzy/experimental/world music trio called “The Itchibites”. Then another trio with a guy who had some ego issues and tried to play all of our instruments at once on stage at the first gig… disastrous. I put together an alt/rock band called “Spiderhead” after moving to Fremantle cos now I sang and played some guitar. We split up after our demo recording cos it sucked… before the editing anyway! I ended up in other bands including one of my faves “Snorkel“. These guys taught me so much cos they were awesome muso’s. Our collective interest in putting on a show was perfect. Snorkel’s take on jazz/latin/experimental/odd-time theatrical performance was ground-breaking for Fremantle and Perth in the late 90’s. The reviewers loved us as did the punters. But I needed to find my voice. I was missing my songs and singing. Being a solo performer suited me as I was always making tunes on my own and layering things on old macs, or sequencing songs in my synths since I was 19. By the time I was 30 I had played in all of these bands then toured Australia as a solo musician under two names: SiN (acoustic/electronic pop) and SiNthetic (DnB/techno/doofdoof). It is true that I performed naked, blew up the sound system at a Fremantle doof and left WA with a final show that included 5 costume changes. They were my crazy times on stage and I enjoyed every minute, every weird arse marketing campaign I thought up and every theatrical show my loyal arty associates helped me to realise. 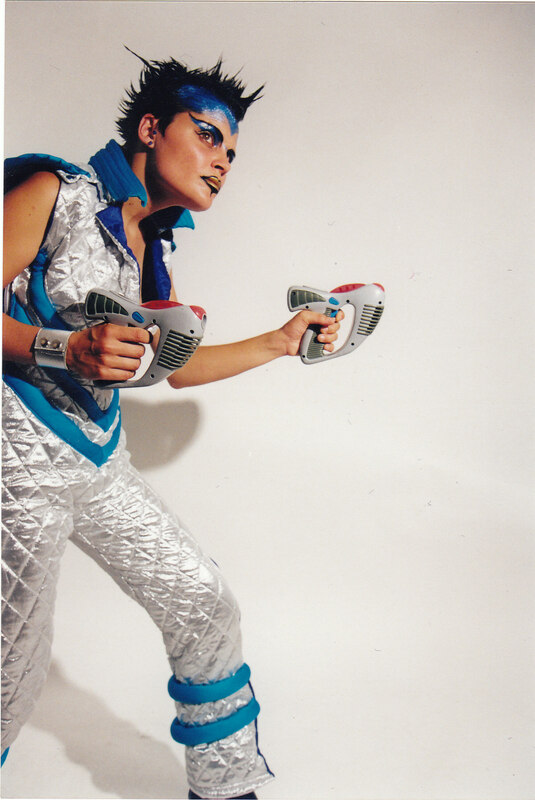 It was the late 90s, I wore loads of PVC and was reacting to the shoe-gazing grunge rockers. I was “too political to support Billy Bragg”. Music is in the blood. It’s the fuel for flight. I will always make music for me and for others. I always have. And yes I did resurrect my “live” career under the new name Pilot Darcy a few years ago. (there were too many r’n’b acts with the name Sin!) Being back on the music scene has been totes inspiring though. I am currently right into remixing again and composing for others. I write acoustic tunes and have plans to release another chilled acoustic album and a smooth electronic one. If you were to ask me my plane of choice, it’s an old cruisey one. You know the kind, with the double wings. Red. Not an F1-11. But I will always fly your fast plane for a remix!